Snoring describes noisy breathing during sleep. Apnoea means pausing in breathing during sleep. Many children will snore if they have a cold or blocked nose and this is common and expected to resolve. However some children, even as young as 18 months will constantly snore and may have apnoea. This article is aimed helping to decide how serious this is. If there is significant sleep apnoea (pausing in breathing noted due to obstruction) then sometimes intervention is needed. Our upper airways consist of the nasal passages, the mouth and the airways of the throat or pharynx. During sleep, these airways are relaxed which can make them smaller. Air being transferred across a narrow passage will become noisy. If there is a partial blockage of these airways the noise can be particularly loud. Some children will snore constantly, and this will affect their quality of sleep. 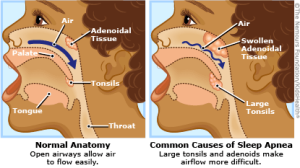 One of the most common reasons is the presence of enlarged tonsils and adenoids which are partially obstructing the flow of air. A second cause of snoring is related to blocked nasal passages which can sometimes be due to allergies. This is termed allergic rhinitis or hay fever. This is a name given for infection of the tonsils which causes them to be enlarged and sometimes appear red and inflamed. For more information see tonsillitis. Recurrent tonsillitis can occasionally be severe enough to warrant removal, and can also contribute to large obstructing tonsils. How Bad is snoring ? Mild – Occasional snorer – mainly with colds but when well has no breathing issues – wait and see approach needed here. Moderate snorer – nighttime noisy breathing, with increased effort noted with breathing, but and occasional apnoea episodes. Severe – Obstructive Sleep Apnoea – this is where there are pauses in breathing due to the extent of the obstruction in the airways. This child will snore loudly, pause and then appear to gasp as the body recognises a need to ‘get some air’. There will be considerable effort required to breath, which is recognised by sucking in of the chest. My Child Snores. How Can I tell if it is significant ? Generally if the snoring and apnoea is persistent (6months or more) and results in symptoms suggestive of interrupted sleep and increased work of breathing, then he should be assessed by a suitably qualified ENT surgeon. Difficulty in school – behaviour and grades. The above symptoms indicate your child requires an assessment by an ENT department, either privately or in the public sector. Obtain a referral from you GP and ensure the above symptoms are listed, which will help your child to be seen sooner, particularly in the public system where long waits can occur.